Baby #3 will be here in less than 17 weeks so I wanted to share my top 7 must have items. 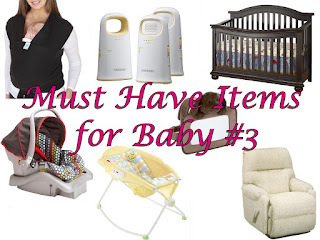 This is my list of items that I knew I needed for sure before the baby came. There are, of course, other items you may need/want and some of these you may not want, but this is what I felt was most essential before welcoming our little one into the world. First up was a carrier. I was not a babywearer with my first two kiddos and have heard so many of my friends talk about how easy it was to get things done while holding the baby and having both your hands free that I decided I wanted to try it out this time. I picked up a black Moby brand wrap at my local Once Upon a Child for $25. Next, was a baby monitor. Our house is a two story and we have 6 acres of land, so I know it's not feasible to always be right next to the baby, whether it's nap time or just being downstairs with the big kids. I picked up the Samsung SEW-2002W monitors for $12 at Once Upon a Child too. 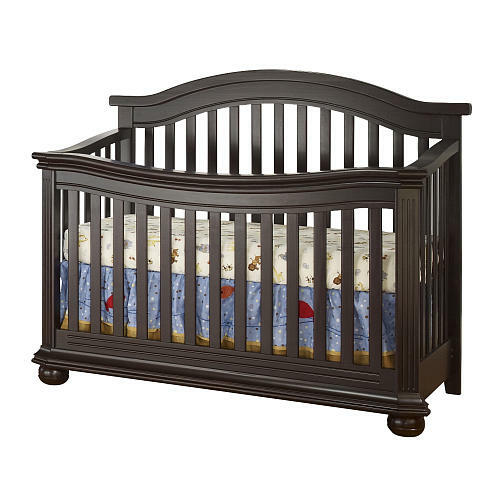 My third item was a crib. The baby will be in our room with us since I'll be nursing and we only have 3 bedrooms, but our room is plenty big for him/her to have it's own little space. Luckily for us, my sister is giving us my niece's crib so money saved there! The fourth and probably most important item on my list was a car seat. 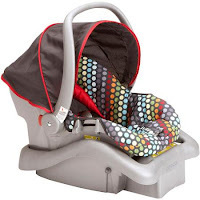 We like the infant carrier car seats more than convertible ones so we can just carry the whole seat instead of getting the baby in and out of the seat in the rain or cold. I found the Cosco Light 'N Comfy DX for $40 on clearance at Meijer. I like the design because it can be for a girl or boy since we don't know gender. 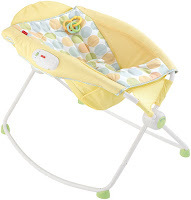 The next thing I wanted was a rock n play sleeper. With my first two I had swings, bouncers, rockers, and every other seat contraption there is, but really, how many places to set a baby do you need? I've heard other moms swear that the rock n play is a life saver so I knew I wanted to get one this time around. I bought a new one off EBay for $30. 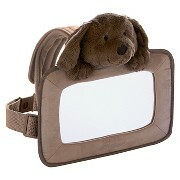 To go along with the car seat I wanted one of those seat mirrors so you can see the baby while in the car. We have a minivan now so Marley will probably be in the back and Mason and the baby will be in the middle. I picked up one at Once Upon a Child for $4. And my final item was a reclining rocker/glider chair. 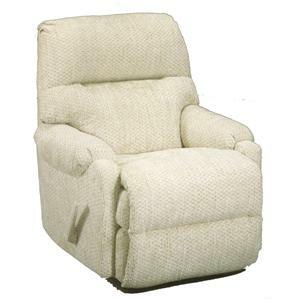 When Marley was born I had a wooden glider chair, but it wasn't really that comfortable so it didn't get a lot of use. I didn't have a special chair with Mason because our love seat rocked so I just used that. Our room is upstairs so I knew if the baby was up at night I wouldn't want to come downstairs to the couch and Mike is a CRAZY sleeper so having the baby sleep in our bed probably won't be happening, so I wanted to get a comfortable chair for our room for those late night nursing/non sleeping nights. Luckily, I got one for free because my brother had a lazy boy chair he wasn't using. So, there it is. My top 7 must haves for baby #3. I've picked up a few onesies and hats for girls and boys that were on clearance when I was out shopping, and of course I've picked up a few boxes of diapers, but until the baby comes that's all I plan on getting. It definitely gets cheaper with each child because you realize what you like and don't like or what is essential and what isn't. With your first child it's so easy to go over board and this time around I have the 'as long as we have a car seat and diapers we're good' mentality. What were some of your must have items?